I am closing my eyes as I write this one. How can my brain, no matter how much I plead, can not properly recall all the details of this trip. It was 2015, Holy Week, me and Cabs agreed on going on this trip. Still, this is one of those secluded islands that I treasure in my heart. An island where, no matter how advanced Malaysia is, no facility to withdraw cash. An island so simple and beautiful that now I am scared that after three years, might be now crowded, dirty and music blaring loudly, killing the zen I once found there. I have no news. I can only share the beauty I once experienced there. It was one of those good times that didn’t require my old definition of a party. 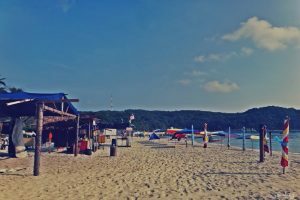 Perhentian Island. I forgot to ask Cabs how we ended up there. My memory is not to be trusted. All I know is that me and Cabs share so many things in common that passed the test of becoming a true soul sisters. 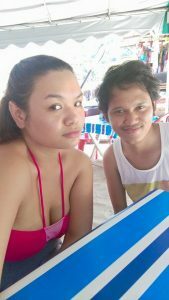 I know him since 2012; since our Citibank days. I went to Malaysia to work, he came to visit, we submitted his CV and he ended up working for the bank where I worked too. Oh good old days. It was a night bus we took from KL (Kuala Lumpur) that brought us to Kuala Terengganu. 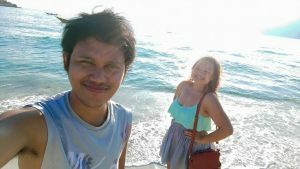 It took us nearly seven hours to reach the terminal where we needed to wait for the bus that will bring us to Kuala Besut where we needed to ride a small boat to reach the beautiful Perhentian Besar. It was a long, tiring yet relaxing ride. Our tandem never runs out of hearty giggles. Our laughs became louder when we found out that there’s actually a bus that goes directly to the port to ride the jetty to the island. There were actually flights to go there too but we were not that good of a researcher before. It was 2015. Travel was not as mainstream as these days. We reached the port and we waited a bit to ride the boat. 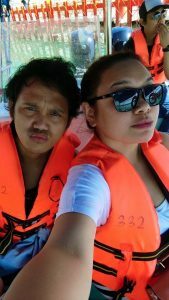 By this time, my fear of the open water is still there but I can now ride boats without so much fuss unlike earlier. It was time to ride the waves and ride the waves, we mean it literally. The wave was the kind that the boat felt as if it goes up a bit in the air and lands on the concrete street. I was holding to the rail as if that will save me in case the boat lands on a little crooked wave and everything breaks apart. If I will die, I will die with a smile. I was in the middle of the ocean going somewhere I want to see and doing what I love. Of course I never voiced any of this out to Cabs. 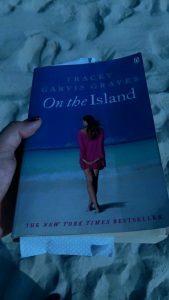 We reached the island and all I could see was endless blue skies, serene white sand and turquoise water. It was so quiet. I can sell Nasi Lemak here and live a slow life. It was that moment that my mind was changing so much. Maybe I am not the corporate woman I have dreamed of becoming. I was a mermaid who’s terrified of the water in my past life and now it is slowly coming back. I just want to be out there, anywhere actually, where I don’t have to be suffocated inside the corporate box nodding to anyone. I will figure out how to live like that. Will not be easy but I will for sure. Like how I have always did. 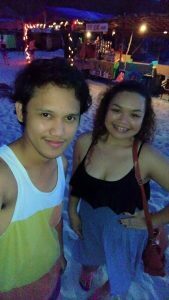 We reached our bungalow, dumped our stuff and went out to start enjoying the beach. I took the book I intended to read in the bus but failed miserably. I lost the will to read over sleep and chit chats with Cabs. The first day was spent where we first landed. For dinner, we went to the other side of the island. It was quieter. 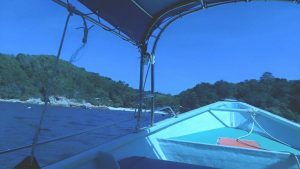 If I close my eyes and try harder to remember, we were just eating, sleeping, laughing and sunbathing in Perhentian. 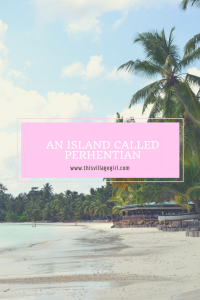 The other side of the island hides Perhentian Cecil (the smaller island) where literally nothing was happening which is perfect for those who just wanted to relax or meditate or to those who are traveling as a family with kids. 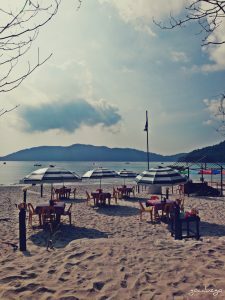 There were restaurants but not as much as Perhentian Besar (the bigger island). 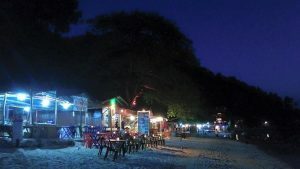 At night, a bar sets up low lying table on the sand and the island was just filled low murmurs of friends enjoying and respecting the serenity of the place. It was not the first time that I saw a firedancer but the amusement and the happiness was different. It was dependent to the mood of the island if I will look for other more fitting word. 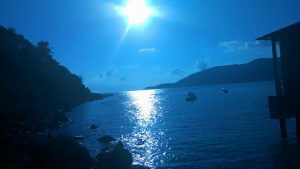 This island is the total opposite of the life that I have come to love KL for where a lot of different things happen everyday that makes it highly impossible to run out of things to do and to try. 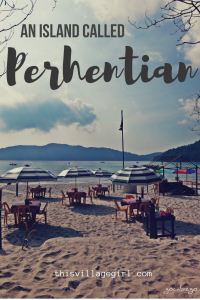 Perhentian Island and Kuala Lumpur are at on the other end of spectrum but garnered the same spot in my heart. 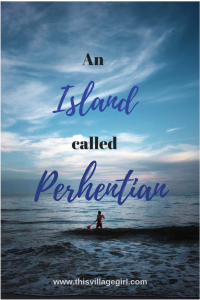 Sounds confusing but that is how much soft spot Malaysia has in my heart and if I will be biased, Perhentian Island is an island that will always be an island that will bring a soft, warm and lazy smile on my lips. 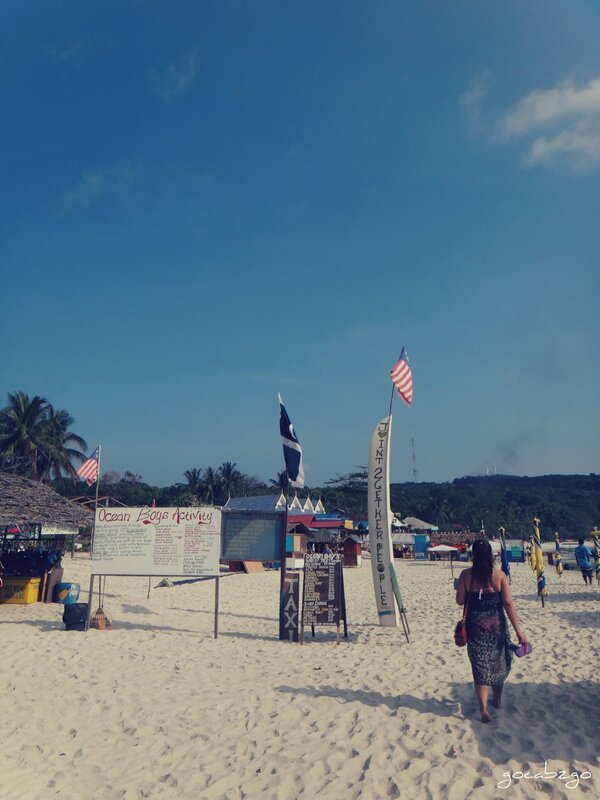 I will always have Perhentian Island. I’ll immediately seize your rss feed as I can’t to find your e-mail subscription link or newsletter service. Do you have any? Please allow me understand in order that I may just subscribe. Thanks. 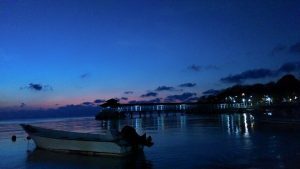 Previous Post Tanjung Pinang: Indonesia’s Hidden Paradise. 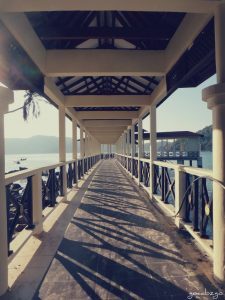 Next Post Expat Diaries: In Malaysia, It’s Never Too Late to Dream a New Dream.